Lene Hara is the main cave of the Ile Kére Kére solutional caves in the Lautém District at the eastern tip of East Timor (Timor-Leste), close to the village of Tutuala. 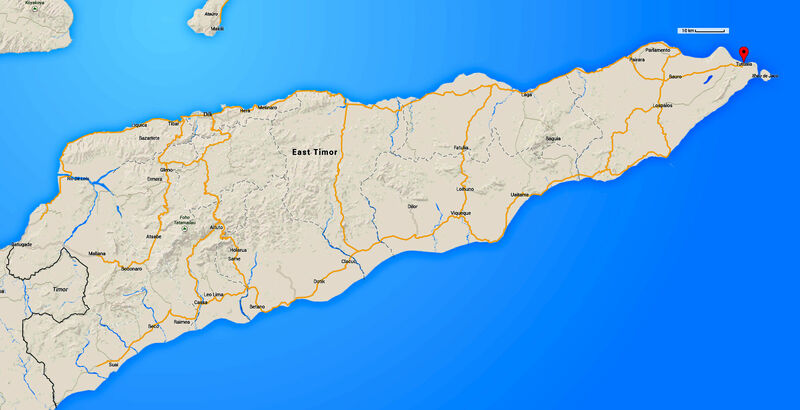 Lene Hara has provided evidence that Timor has been occupied by humans for 35 000 years and thus is evidence of the colonisation of humans making the water crossing of Wallacea between the Pleistocene continents of Sunda and Sahul. The cave was revealed to the scientific community in the early 1960s and first investigated in 1963 by the Portuguese anthropologist, Antonio de Almeida, when Timor Leste was under Portugese rule. 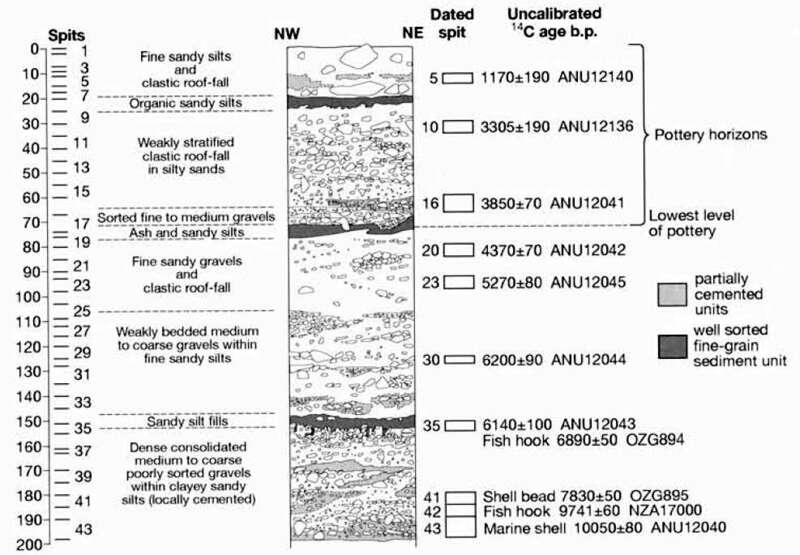 Radiocarbon dating of the cave taken from digs beside those investigated by Almeida, by a team led by Sue O'Connor from the Australian National University, shows deposition of shells (trochus and strombus) by transitory inhabitants beginning at 35 000 years BP. O'Connor et al. (2010) pointed out that the earliest occupation of Australia is dated to around 55 000 BP, so it is likely that the deposits dated at 35 000 years represent another wave of human advance, and has also reported finding in Lene Hara Holocene fish hooks made from shell, and shell beads. In May 2009, carved faces were found high in the cave, and have since been dated to 10 000 years. This was reported in the journal Antiquity of February 2011. 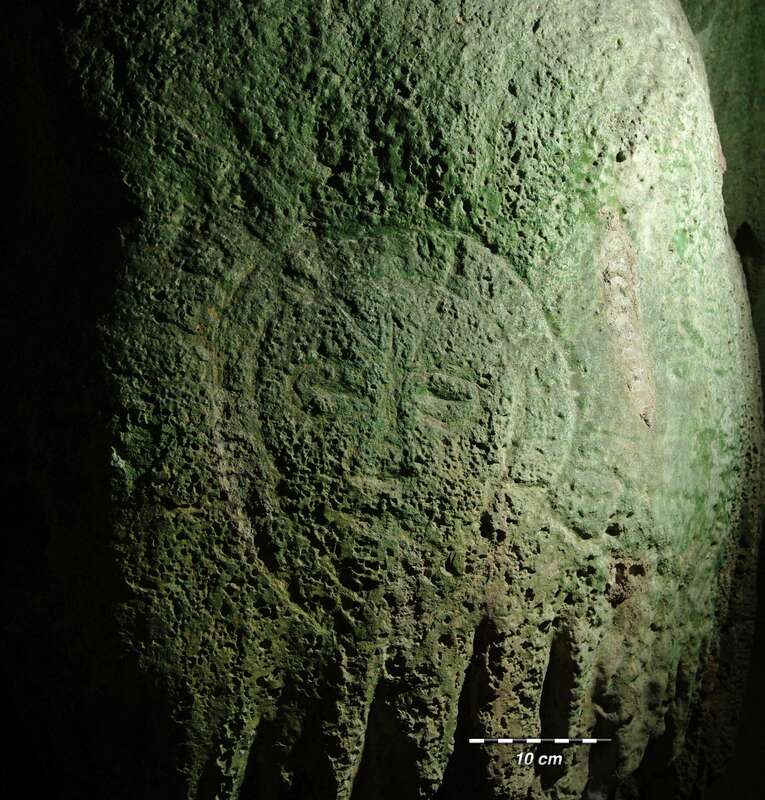 Paintings in Ile Kére Kére are believed to be 2 000 to 6 000 years old. Lene Hara Cave in Timor Leste. One of the faces, which has sunbeam-like rays coming out of it, has been dated at 10 000 to 12 000 years old. Lene Hara is the main cave of the Ile Kére Kére solutional caves in the Lautém District at the eastern tip of East Timor (Timor-Leste), close to the village of Tutuala, shown here. "Just by chance, being down at the right angle, I could see the old weathered engravings on that surface" Dr Aplin said. 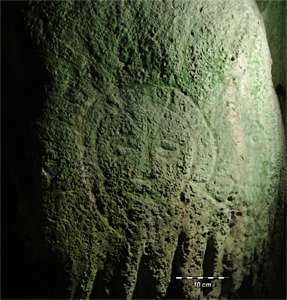 Different groups of researchers have carried out excavations in the cave since the 1960s but had never noticed the carvings. 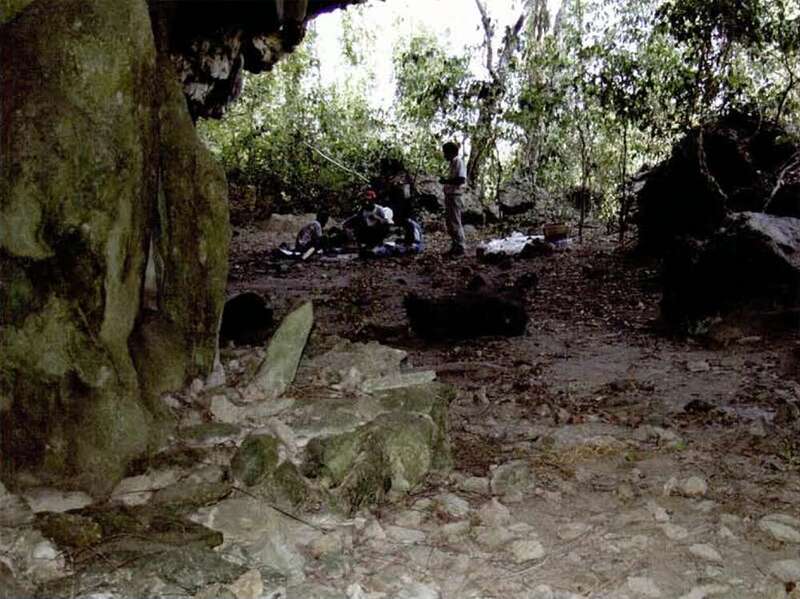 Dr Aplin said the landowners, who often accompany scientists to perform rituals in the cave, were also shocked by the find. "They were totally unaware that the engravings were there" he said. "And they, in fact, decided the faces had revealed themselves on that day as an indication that the ancestral spirits were actually happy with the research." 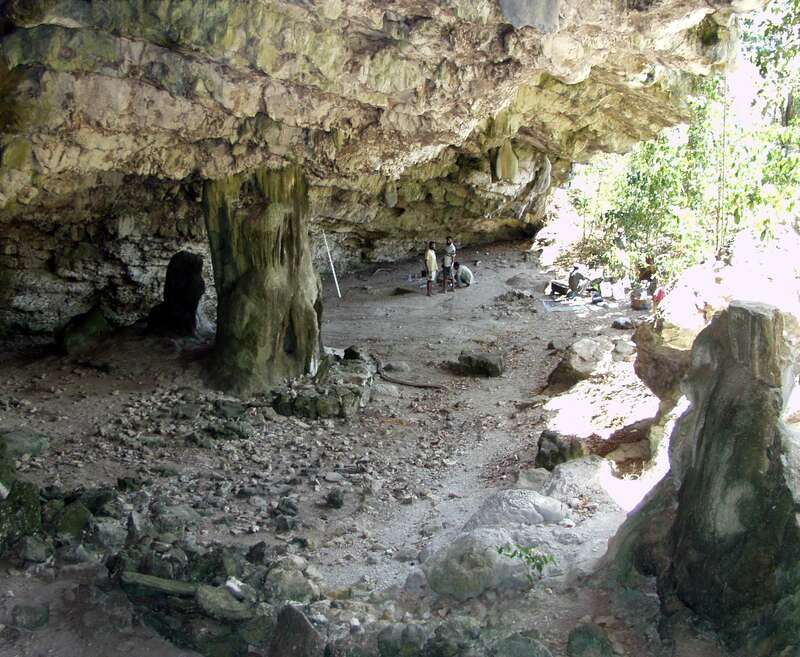 Sue O'Connor, an archaeologist at the Australian National University, said her team's excavations in the cave during the past decade had uncovered shellfish, animals bones, and stone tools dating back 35 000 years. The cave also contains wall paintings, mostly in red ochre, of boats, animals, human figures and hand stencils. Professor O'Connor said the carvings of human faces were an important find because they were the only such petroglyphs found in Timor, and the only rock art in the islands of south-east Asia that dated back to this period. She said the faces were larger than life. "Perhaps they were gods, or representations of very important people" said Professor O'Connor, who is the lead author of a study of the carvings, published in the journal Antiquity. Dr Aplin's excavations on Timor have also uncovered the remains of the biggest rat ever known to have lived, weighing about six kilograms and surviving until 1000 to 2000 years ago. Ancient stone faces carved into the walls of a well-known limestone cave in East Timor have been discovered by a team searching for fossils of extinct giant rats. The team of archaeologists and palaeontologists were working in Lene Hara Cave on the northeast tip of East Timor. "Looking up from the cave floor at a colleague sitting on a ledge, my head torch shone on what seemed to be a weathered carving" CSIRO’s Dr Ken Aplin said. "I shone the torch around and saw a whole panel of engraved prehistoric human faces on the wall of the cave. The local landowners with whom we were working were stunned by the findings. They said the faces had chosen that day to reveal themselves because they were pleased by the field work we were doing." The Lene Hara carvings, or petroglyphs, are frontal, stylised faces each with eyes, a nose and a mouth. One has a circular headdress with rays that frame the face. Uranium isotope dating by colleagues at the University of Queensland revealed the 'sun ray' face to be around 10 000 to 12 000 years old, placing it in the late Pleistocene. The other faces could not be dated but are likely to be equally ancient. 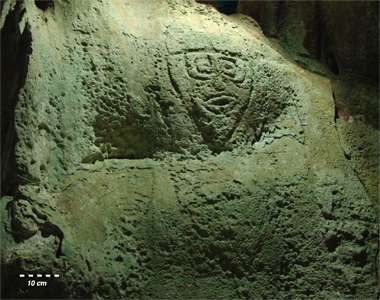 Lene Hara cave has been visited by archaeologists and rock art specialists since the early 1960s to study its rock paintings, which include hand stencils, boats, animals, human figures and linear decorative motifs. The age of the pigment art in Lene Hara is currently unknown but a fragment of limestone with traces of embedded red ochre was dated previously by Professor Sue O'Connor of The Australian National University to over 30 000 years ago. 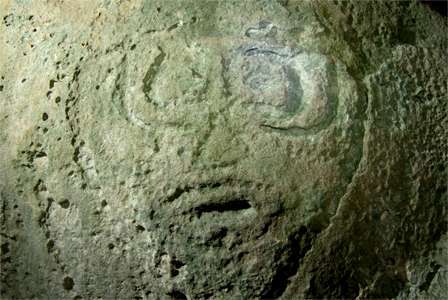 Although stylised engravings of faces occur throughout Melanesia, Australia and the Pacific, the Lene Hara petroglyphs are the only examples that have been dated to the Pleistocene. 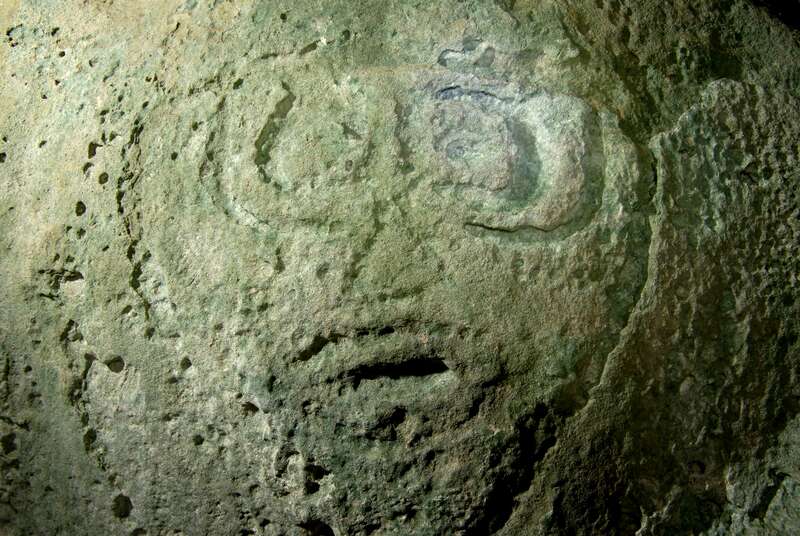 No other petroglyphs of faces are known to exist anywhere on the island of Timor. "Recording and dating the rock art of Timor should be a priority for future research, because of its cultural significance and value in understanding the development of art in our past" Professor O'Connor said. 'Faces of the ancestors revealed: discovery and dating of a Pleistocene-age petroglyph in Lene Hara Cave, East Timor' was published in the Journal Antiquity following the discovery in May 2009. Fish hook from Lene Hara Cave, Square F, Spit 42. 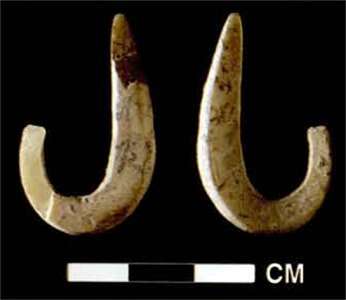 Fish hooks are rare in South East Asian assemblies and none have previously been found which are definitely pre-Neolithic in age. This hook was dated to 9 741 ± 60 BP. 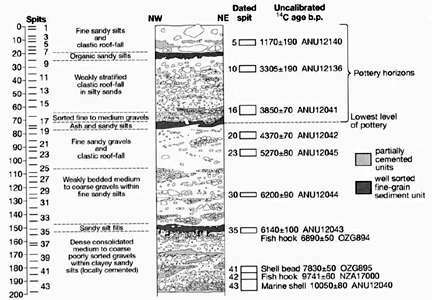 Further confirmation of this date was given by the date of 10 050 ± 80 BP for a marine shell in the layer immediately below the hook, and the date of 7 830 ± 50 BP for a shell bead in the layer immediately above the hook. The hook was made on the shell of the marine gastropod Trochus niloticus, is 40 mm in length, and is missing the tip of the hook. There is no notching for a line attachment, so the line was presumably tied to the upper part of the shank. It is best characterised as a baited jabbing hook for reef fishing of medium sized reef fish. A similar hook was found above this hook, and this second hook was dated to 6 890 ± 50 BP. 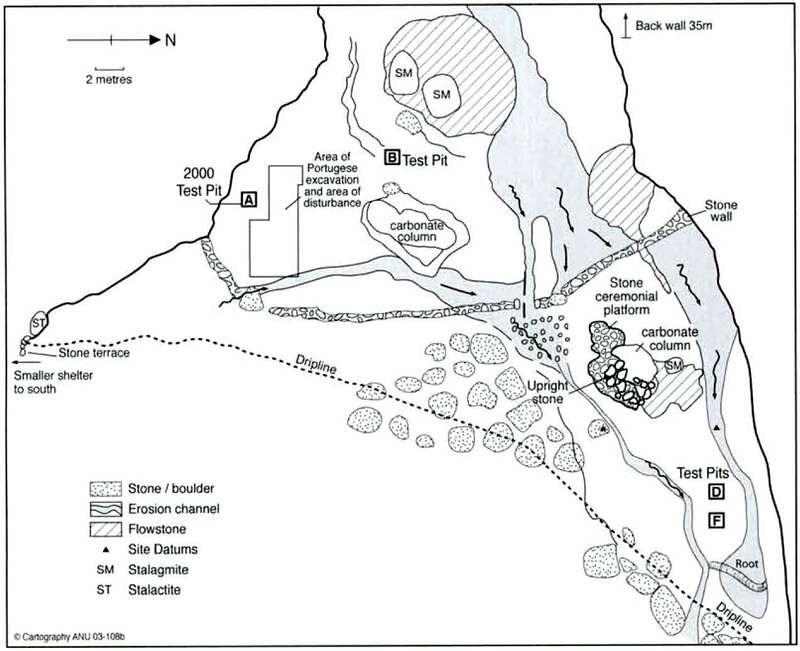 Plan of Lene Hara Cave showing the location of the 2000 and 2002 test pits. Lene Hara Cave looking to lower northern chamber and with large stone ceremonial platform ( tei ) in foreground. Cross section of the dig showing the deposits, ages, and dated artefacts found. 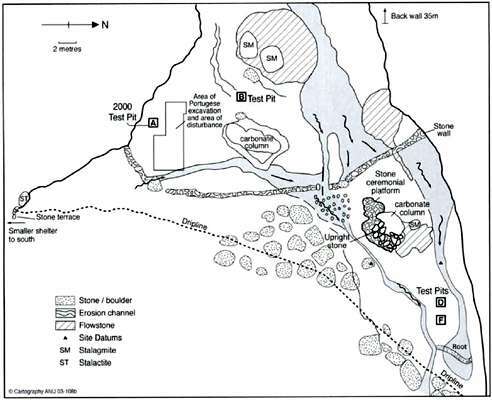 O'Connor S., Aplin K., St Pierre E., and Feng Y-X., 2010: Faces of the ancestors revealed: discovery and dating of a Pleistocene-age petroglyph in Lene Hara Cave, East Timor. Antiquity 84(325):649–665.